Dean Hughson shared a letter with us that he sent to Scandinavian Airlines (SAS) about a recent trip he took with his TravelScoot. Dean said his TravelScoot was so happy it got to ride in business class upstairs that it ran fast through the Stockholm Sweden airport. He had to remind it that it is a servant, not the passenger. 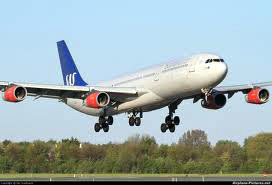 More information about SSA is available at http://en.wikipedia.org/wiki/Scandinavian_Airlines . First let me tell you your help was immensely appreciated. Your notes in the computer helped the ground crew in Chicago understand and I wish I had the woman's name (Belgian I think). She was amazing. She took me to the plane and all of a sudden 2 of your stewardesses picked up my TravelScoot (16 kgs) www.travelscoot.com and carried it to the front of business class and put it in with the luggage there. When I arrived in Stockholm they carried it out and I was one of the first people off of the airplane: felt like a rock star. I happened to be on the flight with long term stewardess Eva who was retiring after 39 years and this was her last flight and her mentoring of the other staff was an inspiration to all of them and to me personally: I love to see someone who loves their job and after 39 years it is obvious SAS loved her also. I observed with my own eyes your staff's careful care for other disabled people and you should be commended. I think if you don't have it already, you should put together a 'panel' of handicapped people to give you info on developments in technology (like TravelScoot) and other things coming down the road in the future. As an aging world, you will see more people needing some assistance to fly and you guys are on it. Thanks again. I will favor SAS with my business in the future. Hi everyone. I received the email message below from a new TravelScoot user. I'm delighted we have fellow scooters all over the world. Keith lives in Thailand and has learned to put up with the "Gawping," but my favorite part is that he ... well, you should read it in his words. I found his email very touching. I am an expat Brit living in Thailand on the 19th January my partner and I took a flight to Singapore to buy a Travelscoot from Nat Cheang the local agent who received us with courtesy and pleasure. We only experienced one small problem on returning back to Bangkok with it, we checked in at Singapore and they said it was ok to use the scooter up to the boarding gate and then leave it for the baggage handlers what a delight to be able to scoot round the airport something I had not done for years but when we got on the aircraft the steward informed us that this airline JetStar did not have a contract with Bangkok baggage handlers to bring it up to the plane on landing so we had to pack it in the holdall and collect it off the carousel However we managed to arrange wheelchair assistance. The moral is to check with the airline before you venture out they also did not allow any type of battery in the cabin. This piece of kit is what I should have had about two years ago I have osteoarthritis in both my knees and was at the point of considering a replacement of the left one however the mobility without pain has negated the need for surgery along with the associated risks at my age (76) I am so thrilled that I can go down to the shopping mall and Starbucks on my own I can now even put up with the "Gawping" (Yorkshire dialect for staring with the mouth wide open) My next challenge will be to take it with me to the UK even thinking about that trip I believed was a thing of the past.